﻿ Opium Also Known As Papaver somniferum. Flower, Food or Drug. You decide. Opium was an extremely important organism throughout history, and is probably more important today. 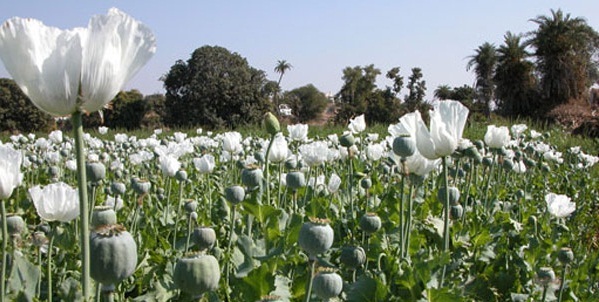 This website will not only contain information showing how important, and in what ways opium is used, but also explains Opium's genetic history, related organisms, where Opium is grown, and much more. Opium is an organism most often associated with illegality and the drug heroine. This is only a very small portion of the many uses of opium. It also has been used throughout history in many other ways. Just one of these many modern uses, Oxycodone, is shown to the left. Oxycodone is a pain medication synthesized from the latex products produced by Papaver somniferum. Opium can be used for many beneficial, medicinal uses, and my goal is to change the perspective that people have of opium. The best way to change a persons perspective on any subject is to present well researched information. To learn about where opium comes from scientists compare organisms very closely related the the studied organism. To see a detailed chart of related organisms, proceed to the Phylogenetic Tree page.